Each year the National Oceanic and Atmospheric Administration releases an Arctic Report Card, detailing the observations of land, ice, and ocean observations. The report, now in its 13th year, was compiled by 81 scientists from 12 different countries. It details the second-warmest year on record in the Arctic and explores how connected different weather patterns and ecosystems are across the globe. This year&apos;s report reveals surface air temperatures in the Arctic continue to warm at a rate almost double the rest of the planet. Researchers found a decline in Arctic animal populations and an expansion of harmful toxic algal blooms. At about 3.1 degrees warmer than the 1981-2010 average, 2018 was the second-warmest year on record in the Arctic. The spots experiencing the most warming were the Chukchi Sea, eastern Siberia, and the Arctic Ocean. Since 2014, every year has been warmer than all prior records dating back to 1900. According to the report, the Arctic continues to warm at a rate of almost double the rate of the global average temperature. There are many factors that contribute to the Arctic warming faster than the rest of the globe including, less snow and ice reflecting sunlight, more heat being absorbed by the surface of the water and ground, and warmer bodies of water releasing more heat into the atmosphere late in the year. Arctic sea ice has decreased dramatically in recent decades. Each winter, ice builds in the Arctic before the summertime melt occurs. In 1985, new ice formed in winter made up 16 percent of the Arctic ice pack. In 2018, at a winter maximum in March, new ice made up just 1 percent of total Arctic ice. Even the older ice, surviving decades, makes up a much smaller percent than it once did. As less ice forms and more water is open, more ships are able to sail through the Northwest Passage. Sea ice is an important part of the Arctic ecosystem. Ice slows the heat exchange between the ocean and the atmosphere and reflects incoming sunlight. As the Arctic continues to warm, the impacts on wildlife are widespread. Each year the number of caribou and reindeer in the Arctic varies, but populations as a whole have declined since the mid-1990s. Counts of those animals have declined some 56 percent, dropping from near 4.7 million to about 2.1 million in the past two decades. Not all herds experienced a decline, but many are considered rare, decreasing or threatened. Warmer conditions also allow toxic species to flourish. Over the past four decades, paralytic shellfish poisoning (PSP) has increased seven-fold in Alaska, according to the 2018 Arctic Report Card. PSP is caused by eating shellfish that has ingested a harmful algae bloom. These harmful algae blooms not only affect humans who ingest the shellfish who feed on the algae, but marine life as well. In Alaska, this is affecting birds, sea otters, walruses, seals, whales, and many other marine mammals. The impacts of a warming Arctic can be felt around the globe. Researchers say some of those impacts are very clear, such as severe heatwaves, more frequent heavy precipitation events, and more intense droughts. As the Arctic continues to warm, scientists are becoming more interested in how this rapidly warming climate will affect extreme weather events. There is a general hypothesis that a rapidly warming Arctic is causing the jet stream to become slower, and meander more, leading to larger waves and therefore more extreme weather events. A big southern dip, also known as a trough, is what brought bitter cold to Europe back in March. 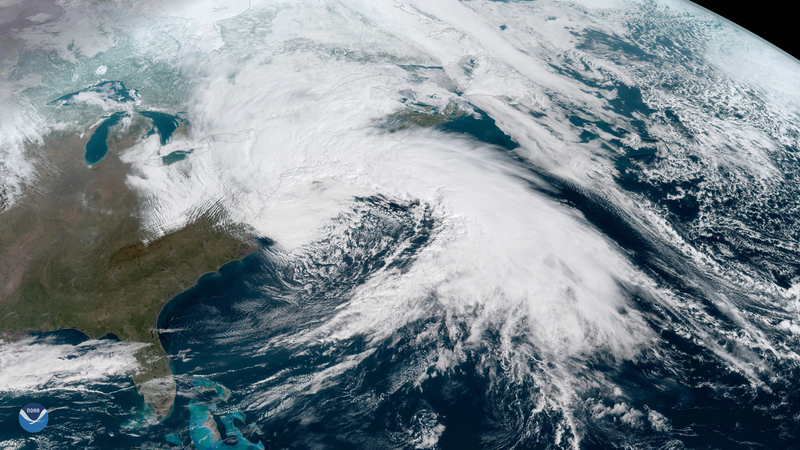 Likewise, the amplified pattern was responsible for the historic string of nor’easters that pummeled the northeastern U.S. earlier this year. The Arctic Report Card is meant to be used as a tool to help those facing the effects of climate change, which climate scientists say is everyone. While the impacts of a warming Arctic are vast and something we don’t fully understand, climatologists use the report to monitor the effects of warming in one of the most impacted regions of our planet. NOAA uses the report to guide priorities and understand the role of the Arctic in climate change and extreme weather around the world. Biologists use it to understand the impacts on ecosystems.